Did you know that you can save a ton on fresh meat just by buying in bulk? One of the best ways to save on beef is to buy a cow. 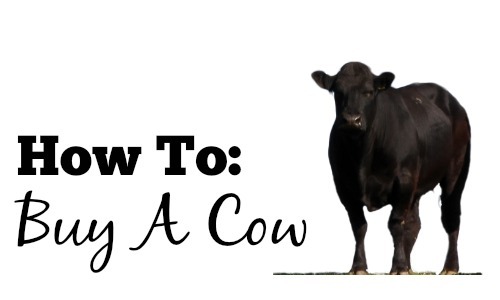 Learning how to buy a cow though takes a bit of research. Don’t worry at no point do you have to meet or name the cow! This is the starting point. You can either do the ground work yourself or make a quick call to a local butcher and let them do all the work for you. If you want to do the work yourself, then use internet searches for local cattle farms or talk to farmers you know to see if they will direct sell to you. Don’t forget to also ask friends and even posting a question to Facebook. Skipping straight to the butcher, they will make these calls for you and many times know farmers already. There are also two web sites that have directories of farms that are selling grass-fed beef: Eat Wild and Local Harvest. Are prices based on live weight, hanging weight or finished weight? This will be drastically different weights. Live weight is the weight of the cow right now standing in the field, hanging weight still has some bones and tissue that won’t be in finished cuts, and lastly the finished weight is exactly what you will take home and put in your freezer. Hanging weight is usually about 60% off the live weight. Finished weight is usually 75% of hanging weight. Killing fees, butchering fee etc. When is payment due, and what form of payment do you accept? Can I make any requests in how the cow is butchered (i.e. more ground beef instead of roasts)? What are the typical cuts included in a whole cow and how much of each are there generally? Are any chemical treatments used on the fields where the cows are grazing? Is any of their feed genetically modified? Are your cows given hormones or antibiotics? Are your cows grass or grain finished? Keep in mind some of the questions above will provide the same answers from farm to farm. Most farms take their cows to market once or twice a year and usually in warmer months (cows weigh more in the summer than in the winter). Because they aren’t always butchering you need to plan to get enough to last for a long stretch. We usually buy enough for a year and only do this once a year. You don’t have to buy the entire cow. You can find a few friends and split a whole cow or possibly even find a farm that allows you to buy a half or quarter cow. I really can’t imagine needing an entire cow for one family… that would be enough meat to last you 4-5 years probably. We tend to buy 1/4 cow at a time. You will need to factor in your budget, your families needs and your freezer space before deciding how much to buy. Let’s say that you were buying a cow whose live weight was 1,000 pounds. If you were paying based off of the hanging weight (which is pretty normal), you are going to be doing some estimating. Let’s say the cost was $3.15 per lb of the hanging weight. Your hanging weight is going to be around 600 pounds and so the upfront cost per pound would be $1,890 (600 lbs x $3.15 lb). That’s still not the price per lb that you are used to in the grocery store though. Now take the 600 lb hanging weight and remember that we are only getting 75% off that in finished weight or around 450 lbs. In the end you paid $1,890 or around $4.20 per lb. This may also not include your butchering fees (usually a flat fee around $50-$75). Seeing the $4.20 per lb may make you feel like this isn’t a big savings… this is where being able to order specific cuts is important. I tell our local farm that I want very little ground beef and mostly roasts, ribs and steaks. I can get ground beef in bulk for less than $3 per lb, so I would rather get cuts that are much more expensive in the grocery store. When was the last time you got steaks for $4.20 per lb? See if they will vacuum seal cuts for you. This way can get home and put meat straight in the freezer with no work. If they only wrap in butcher paper, you’ll need to repackage before freezing. Make sure you have freezer space! This seems obvious, but this isn’t going to fit in your regular fridge/freezer. If you go in with friends and split a cow, someone has to take the parts no one wants… tongue, liver etc. They aren’t big cuts most of us want but you need to be okay with dividing equally.